Albino cats are not simply kitties that happen to be white. Albino cats are very rare, with only two percent of all cats being albino. Albino cats also require different care than a white cat. Here’s everything you need to know about albino cats. Albino cats have a genetic alteration that makes them different from all other cats, including white cats. Albinism is caused by a gene called TYR. The TYR gene determines the presence of tyrosinase, an enzyme needed by the body to produce melanin. An albino cat is born with a damaged or missing TYR gene. Melanin is the pigment that decides the color of a cat’s eyes, skin, and fur. This lack of Melanin is what makes cats albino. 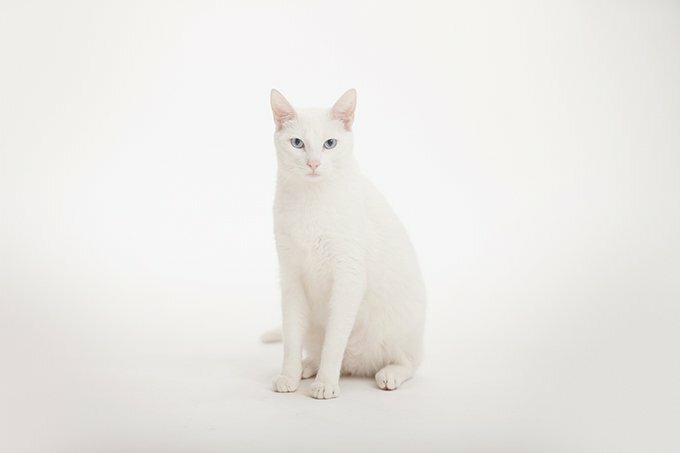 How Does An Albino Cat Look Different From A White Cat? Albino cats will have skin that appears pink along with eyes that can range from a very light blue to a hue of reddish pink. Pink isn’t the actual color of the skin, but rather light reflecting blood flow. The same goes for albino cat’s eyes. The lack of melanin allows the reflection of light to play a trick, mirroring back the blood vessels of an albino cat’s eyes. 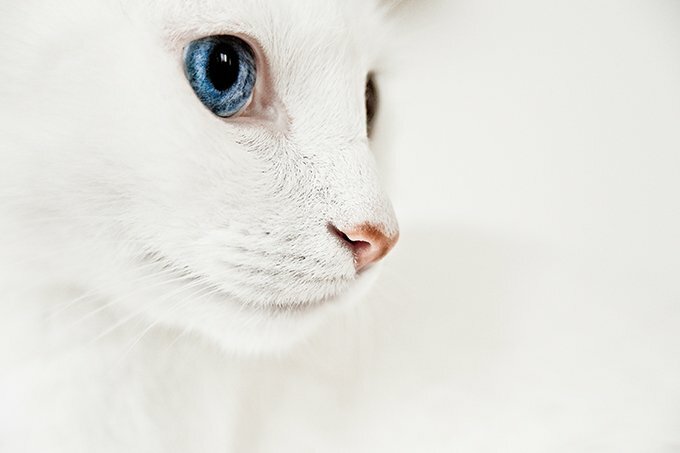 White cats can have any color eyes and may even have heterochromia, or two different colored eyes. Albino cats do not have the melanin to produce a range of eye colors, such as gold, green, or brown. True albino cats follow the above requirements. There are degrees of albinism, however. Partial albinism is much more common than you may think. 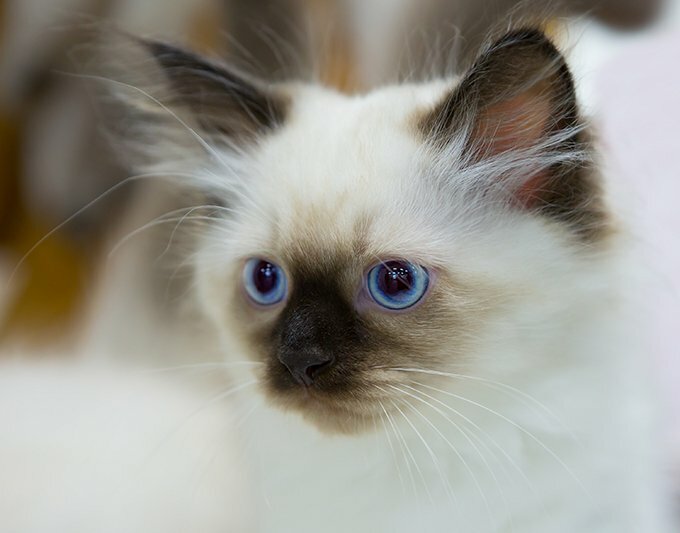 In fact, cats such as the Siamese, Burmese, and Tonkinese all get their pointed coloration from a partial albino genetic lineage. Albino cats are light sensitive. due to their lack of melanin, albino cats are especially sensitive to sunlight. 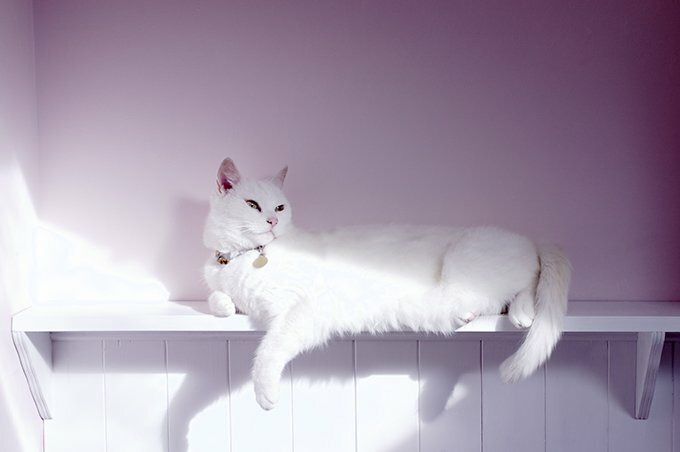 If you have an albino cat, be sure to monitor his time in direct sun. Albino cats are more prone to sun damage and skin cancer because of this. Albino cats can also suffer eye damage from sunlight. Again, the lack of melanin leaves the eyes defenseless to UV rays, and can cause blindness in an albino cat. Albino cats may suffer immune system issues. Melanin is also important in keeping both cats and humans’ immune systems strong. 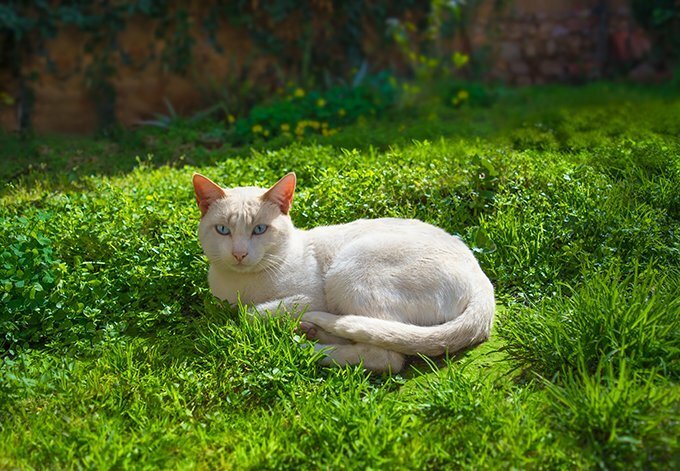 Albino cats may be more susceptible to illness or immunodeficiency due to this. Albino cats, if bred for their albinism, may also be prone to overall health issues. Albino kittens that are bred come from a short-spanned breed of albino cats, which makes them more prone to developing health issues that may not be as big of a threat to a white cat. Albino cats can also be a bit clumsy. This is thanks once again to their lack of melanin. Melanin aids in depth perception, so albino cats may bump into things occasionally. Albino cats sometimes get the stigma attached to them that they are more prone to deafness or hearing disabiltiies. Some studies show that white cats are harder of hearing than other cats. Some mistake albino cats for white cats and assume the it must be the same. There is not evidence albino cats are more prone to deafness than white cats. Do you have an albino cat? Does your albino kitty have any health issues? Let us know in the comments.